Sally Piefer | Wisconsin Wage and Hour Lawyer | Lindner & Marsack, S.C.
Sally A. Piefer is a partner with the law firm of Lindner & Marsack, S.C. Ms. Piefer has extensive experience representing employers in a variety of employment matters, with special emphasis in employment litigation, employment counseling and compliance issues and employee/supervisor training. Sally's litigation practice has involved representing and defending employers in employment discrimination, wage & hour, FMLA, ADA, OSHA and unemployment compensation claims. Sally also drafts and enforces employment agreements and separation agreements. She also frequently drafts, advises clients and litigates claims involving non-competition, non-solicitation, confidentiality and duty of loyalty issues. Before joining Lindner & Marsack, Sally led the employment law team at a small Waukesha area law firm for more than 17 years where she represented employers in a wide variety of employment-law needs. Sally is recognized as having an AV rating with Martindale-Hubbell, the highest rating possible, for professional competency and ethical conduct. Sally received her law degree from Marquette University Law School; she obtained a degree in paralegal studies from Roosevelt University and she received her undergraduate degree in business with a law emphasis from the University of Wisconsin-Whitewater. Sally is licensed to practice law in the State of Wisconsin and is admitted to practice in the United States District Courts in the Eastern and Western Districts of Wisconsin, and the Northern District of Illinois, including the trial bar. She is a member of the Wisconsin Bar Association, the American Bar Association (ABA), the Waukesha County Bar Association and the Society of Human Resources Management (SHRM). 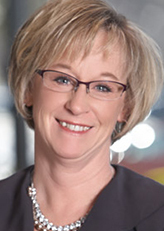 Sally has an extensive background in employment law and is frequently asked to present on employment-related topics with a variety of organizations throughout southeastern Wisconsin. She has also received accolades as a “Women in the Law” from the Wisconsin Law Journal and special recognition from the Waukesha County Community Foundation’s Women of Distinction. Sally also sits on a variety of boards, working with those organizations on human resources compliance.